A major new project to investigate how heat and carbon is transferred around the oceans kicked off in April. Here Carol Arrowsmith, a senior technician with the Stable Isotope Facility at the British Geological Survey (BGS) tells us how the BGS are contributing to this important research……..
After years of planning, NERC commissioned several highly ambitious research programmes that required its Research Centres to work together to tackle several major scientific and societal challenges. One of these is a programme called “Ocean Regulation of Climate through Heat and carbon Sequestration and Transports” or ORCHESTRA involves the BGS, and in particular me as one of the major analysts. We aim to use a long term survey, together with computer simulations, to improve our ability to understand and predict the role of the Southern Ocean currents to modulate global climate. My particular contribution to this research is the analysis of the oxygen and carbon isotope composition of the ocean waters along several transects from the Atlantic equator to the ocean around Antarctica. The data I will produce will help us trace marine currents and see where carbon is either absorbed by the ocean or is expelled. This is particularly important due to current increases in atmospheric CO2. 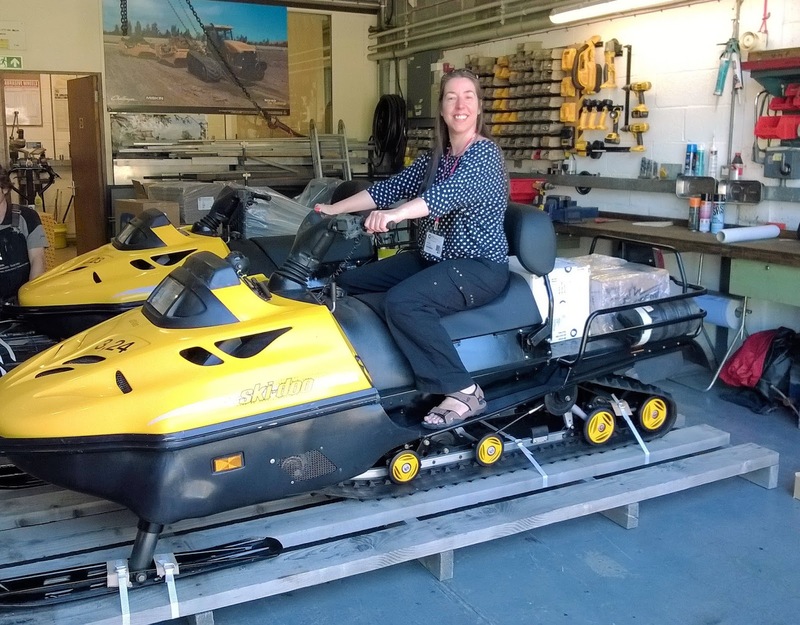 At a recent meeting at the British Antarctic Survey in Cambridge I collected the first 1000 samples and the data production is underway. The further 14000 samples collected over the next 5 years will keep me busy! I look forward to seeing the first data and will provide regular updates on our discoveries about how heat and carbon moves around the oceans. The ORCHESTRA programme is led by Prof. Mike Meredith (British Antarctic Survey) in partnership with several NERC Centres including the BGS. In the same year that the British Geological Survey was founded (1835), Henry Fox Talbot produced the first silver chloride camera negatives on paper and conceived the two-step negative-positive procedure for making photos that traditional cameras still use today. Since those early days of photography, it has grown to become the geologist’s faithful companion. Photography has been crucial in gathering a scientific evidence base that paints an ever more detailed picture of how our planet works. For World Photo Day last Friday, we did a straw poll of our favourite British Geological Survey image. Hutton Roof Crags, which lies between the Lake District and the Yorkshire Dales national parks, came out on top. This part of Northern England is underlain by an amazing array of different rock types, with an exposed geological history spanning almost 500 million years. Over the last 200 years, its mineral wealth has been crucial for industrial change and has contributed to the wealth of the UK. Our rich and complex geology has also created some of our most dramatic landscapes: providing geologists with major clues as to how our planet formed and evolved. It is indeed no coincidence that many UK geologists, including some that worked with and for the British Geological Survey are regarded as the pioneers of geology. Hutton Roof Crags, at Holme Park Fell in Cumbria, is made of limestone that formed during the Carboniferous period over 300 million years ago. Due to the solubility of limestone, natural weathering often results in the formation of limestone pavement. This strange-looking landscape is made up of limestone blocks that developed in between a network of natural vertical fissures that formed as cracks or fractures within the limestone were widened and deepened by acidic water. 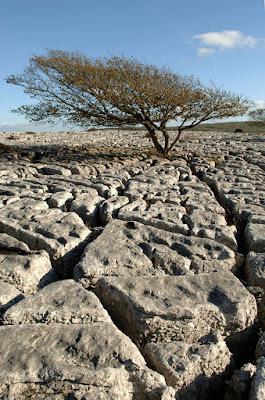 The lack of soil coverage means that very little, if any vegetation can grow on top of the limestone. However, the presence of deep fissures or ‘grikes’ allows for soil development, and provides shade, humidity and protection from grazing. 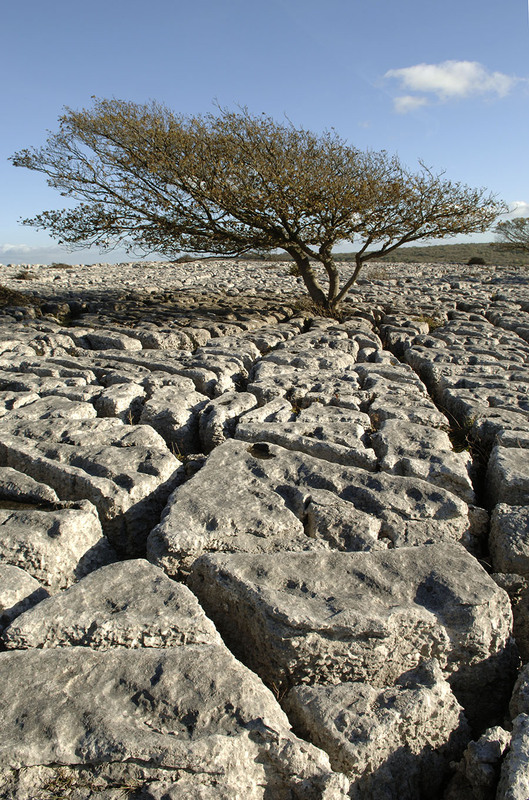 Because of these unique conditions, limestone pavement can host typical woodland species, not normally associated with apparently exposed and barren landscapes. Read more about how the complex geology of the UK has helped us to understand our planet at Discovering Geology. The British Geological Survey has led the world in using 3D geological models, rather than 2D maps, for improving scientific understanding or communicating science. Such models often need to be created very quickly to visualise and understand the issues and then explain the implications. 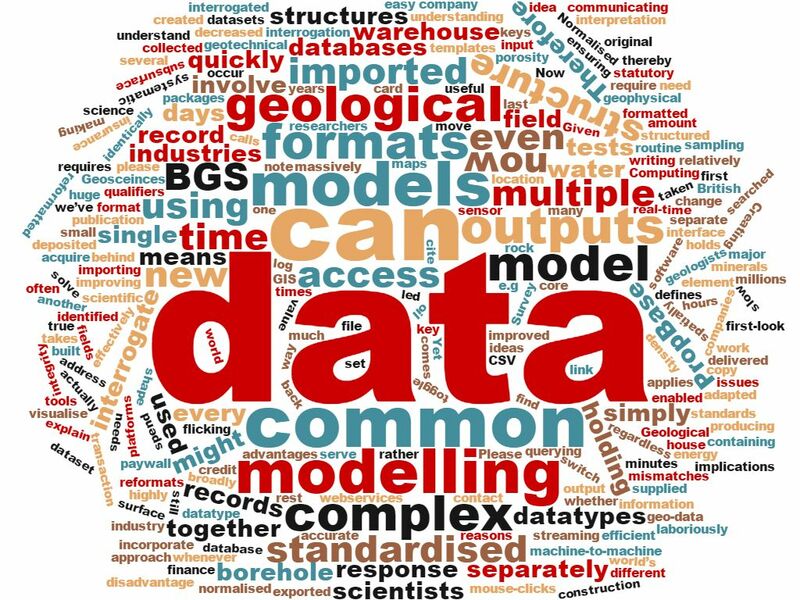 But producing such models requires easy access to complex geological information; accurate models require multiple datasets to be supplied and interrogated in common formats. Yet of the huge amount of geological data that BGS holds from borehole or surface and subsurface sampling, we actually acquire a relatively small of the data ourselves, the rest is deposited with BGS for statutory reasons. Therefore a new geological model might incorporate data collected by any (or even all) of the water, energy, minerals and construction industries, each delivered in their own formats to their own standards. For the last 25 years, BGS has been holding data in normalised structured databases. Normalised data means holding every element of your records separately and once only, with keys to then link these fields together. This is highly efficient, it means that whenever you move house your credit card company only needs to change one address field and not every transaction record. The disadvantage of such an approach can be slow response time and complex data structures for scientists to interrogate. Creating a 3D model might involve interrogate 17 major databases, with 50 datatypes containing millions of records. 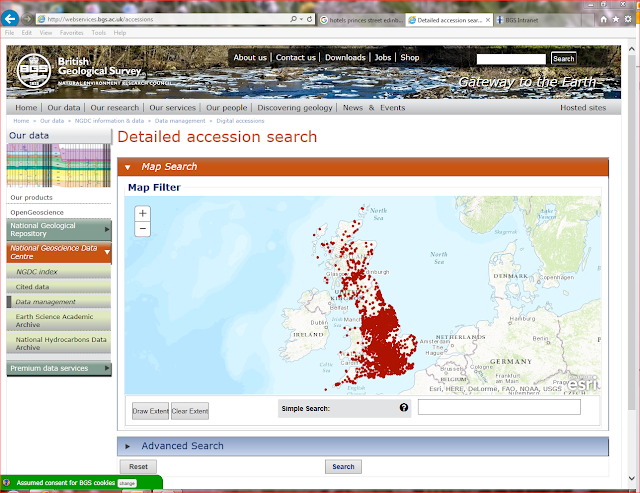 Until now, each dataset has to be searched separately using different tools and then laboriously reformatted. So making a “first-look” 3D model could involve several days work before any interpretation can occur. To solve this we’ve adapted another idea from the finance insurance industry and built PropBase the world’s first true geo-data warehouse. A data warehouse takes a copy of the original data (thereby ensuring its integrity), then reformats the data back together in a standardised structure, and outputs them in common formats. Given that all data used in 3D models has a broadly common structure (a location in 3D, then the datatype, its value and any qualifiers) they can be imported in a common way. Therefore PropBase outputs these data standardised into a common set of multiple output formats from each record (e.g. a GIS shape file, a CSV for importing into modelling packages or webservices for machine-to-machine interrogation) by simply flicking a “switch” to toggle between them. The key advantages are massively improved data response times to querying and standardised outputs so data can be imported much more quickly by modelling software, these same ideas are now being used as templates for more complex datatypes such as real-time streaming of sensor outputs. So now regardless of whether your density or porosity data comes from field tests by geotechnical companies, rock tests of borehole core from the oil or water industries or even some geophysical log data, this can all be simply exported in a common format from a single interface with a few mouse-clicks and imported into your modelling platforms using a single input routine because they are identically formatted (but still separate so any systematic data mismatches can be identified), the time taken to do this has decreased from many hours or even days to a few minutes. 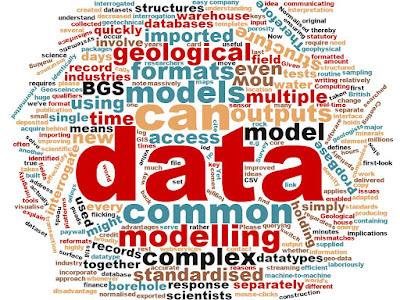 Now modelling geologists can spend their time modelling not writing database calls. Our new publication in Computing and Geosciences defines this new data structure and applies a model for how scientists can effectively access and serve complex multiple spatially enabled structures. If you find it useful please cite it. (Please note that this is behind a paywall, researchers who cannot access this should contact me). My name is Beth Penrose and I’m a postdoctoral researcher based at the University of Nottingham, working on the MAG-NET project. This project, funded by the Sustainable Agricultural Research and Innovation Club (SARIC), brings together soil geochemists, plant scientists, crop breeders, vets and fertiliser experts from British Geological Survey (co-PrincipaI Investigator (PI) Louise Ander), University of Nottingham (co-PI Martin Broadley), Aberystwyth University (co-PI Alan Lovatt) and a number of commercial companies to tackle the issue of Mg and other micronutrient deficiencies in ruminants, such as cows and sheep. Magnesium is important in ruminants for nerve and muscle function, bone formation and in biochemical processes and therefore Mg deficiency in ruminants can be a major problem. Chronic, low level Mg deficiency and mineral imbalances can affect the amount of meat and milk farmers can get from their cows and sheep, whereas acute, high level Mg deficiency (hypomagnesaemia) causes ‘grass tetany’ or ‘grass staggers’, where animals paddle their feet and blink excessively due to loss of nerve function, and which can be fatal if not treated. For farmers, losing animals is a big deal both personally and economically. By using a multidisciplinary approach, we hope to be able to develop strategies for combating Mg and other mineral micronutrient deficiencies from multiple angles. These include improved soil management and crop breeding for improved forage nutrition. As part of the project, we are conducting surveys into farmer awareness of hypomagnesaemia. 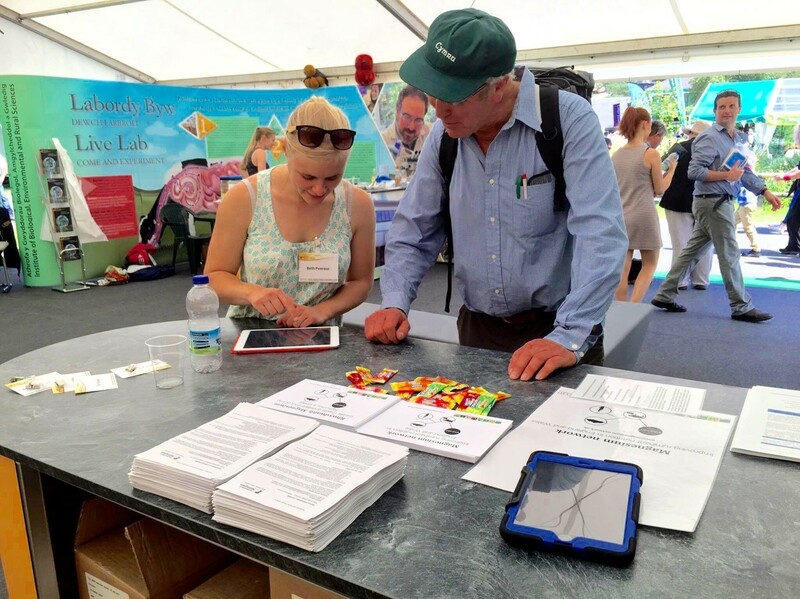 During the show, I was based in Aberystwyth University’s Institute of Biological, Environmental and Rural Sciences (IBERS) tent, and was able to get 75 farmers to answer a short questionnaire about their knowledge of Mg deficiency and what they are doing to prevent it in their animals. It also gave me a unique opportunity to have some really meaningful dialogue with farmers about their concerns about mineral deficiencies in general, which will help us optimise our project to give farmers as much useful information as possible. 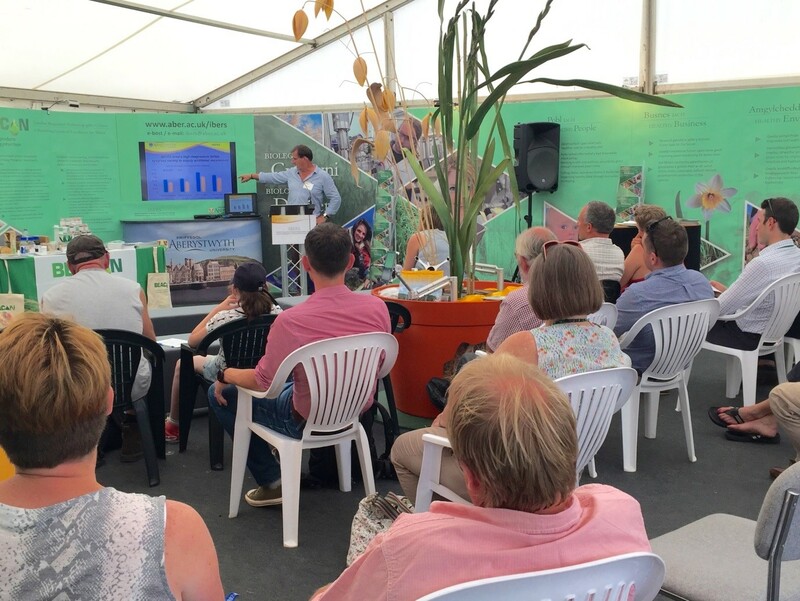 Alan Lovatt, a grass breeder from IBERS, a co-PI on the MAG-NET project, also gave a talk about the project to show-goers in the IBERS tent. This helped to increase awareness of the project and stimulated some interesting discussions between Alan, myself and farmers in the audience. 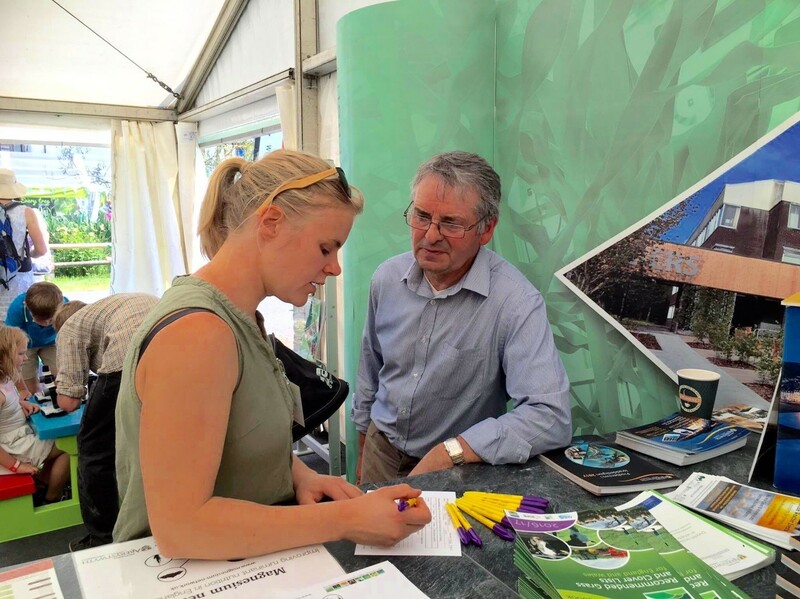 After such a great time in sunny Builth Wells, it’s now time to roll out the questionnaire to the rest of the UK with the help of project partners from the veterinary sector. We’re hoping we have as positive response from these farmers as we did at the show! If you have any questions, or would like to take part in the survey, please go to www.magnesium-network.uk or contact me at beth.penrose@nottingham.ac.uk. We are now on a nine day transit back to Falmouth after a long and highly productive cruise to the TAG hydrothermal field on the Mid-Atlantic Ridge at 26oN, 45oW. This was a very complex cruise due to the number of novel exploration and resource assessment technologies we deployed, and the extensive sampling we undertook in extreme water depths and below the seafloor. Despite our ambitious objectives and many technical challenges we have acquired a substantial new dataset comprising rocks and sediments, high resolution images and video of the seafloor and geophysical data. This will significantly enhance understanding of the distribution and style of mineralisation on this part of the Mid-Atlantic Ridge. 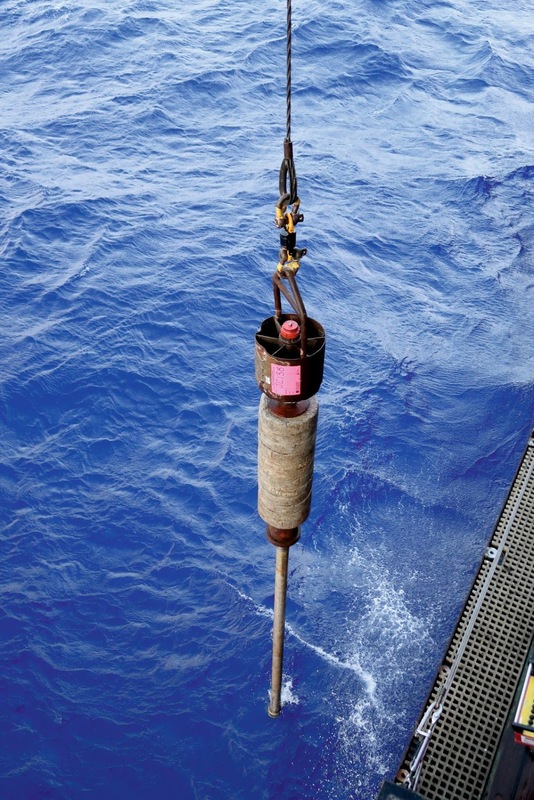 Sediment coring using both gravity and mega-coring devices has been an important part of the programme. These samples provide valuable information on the composition and geochemistry of sediments overlying and proximal to the sulphide mounds, and on a regional scale in order to determine potential vectors to the mineralisation. When the cores arrive on the ship they are quickly moved to the cold laboratory to minimise degradation. Pore waters are extracted for analysis once back ashore and the cores are then split for logging and subsampling. The cores typically comprise pelagic carbonate ooze and variably oxidised clays, locally containing sulphide-rich layers, which vary in thickness with distance from the hydrothermal source. 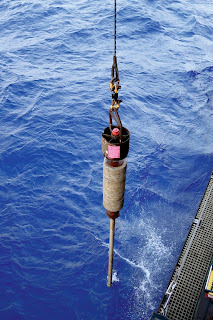 Changing a core barrel on RD2 on the seabed in water depths of about 3500m. Core can be seen in the barrel in the left-hand image. which was challenging to drill through. 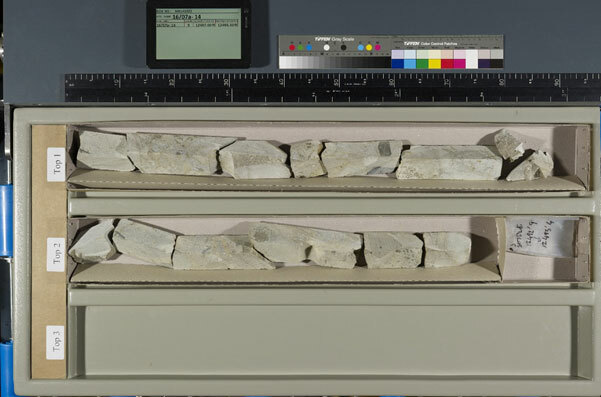 Whilst the sediment cores provide information on the composition of the upper 2-3 metres of the seafloor a key aim of this project was to sample the inner parts of the extinct massive sulphide mounds. This is necessary to improve understanding of the internal structure, mineralogical composition and metal distribution in these deposits, which is vital for determining their future resource potential. This can only be achieved through drilling. BGS with its rock drill 2 (RD2) drilling system has an almost unique capability in this area. Operating the rock drill in water depths of >3500 metres was a major test for the equipment, drilling crew and the coordinating scientists. 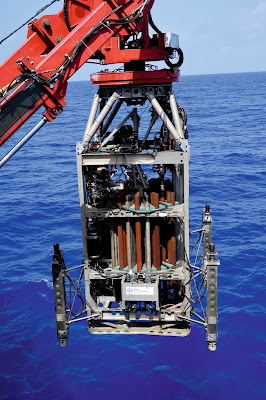 It represents the record for the deepest operation of a seafloor lander style rig, with water depths well in excess of those encountered in the Atlantis Massif area where RD2 was previously deployed on International Ocean Discovery Programme (IODP) Expedition 357. The rig has the capability of drilling up to 55 metres below the seafloor using a carousel system. HyBIS dive on new mound. Unfortunately due to a combination of technical issues, the very challenging seafloor environment (significant sediment cover and steep slope angles) and drilling conditions the deepest hole we drilled in the TAG field reached about 12.5 metres below the seafloor. This hole was drilled in a relatively newly discovered sulphide mound, which we have named ‘Rona Mound’ after the late Professor Peter Rona, a marine geologist who helped pioneer deep seafloor exploration notably along the Mid-Atlantic Ridge. Core recovery (about 27 per cent average from eight holes) from the holes that we have drilled with RD2 has been lower than expected due to a number of reasons. The contrasting geology encountered, ranging from soft sediment in the upper parts of the seafloor, transitioning into a consolidated highly oxidised zone, containing very hard jasper-rich layers, and below that massive sulphide made for challenging drilling conditions. This required the testing of a variety of drill bits (profiles and hardness), sometimes drilling open holes before changing to coring, and significantly varying drilling parameters including torque, bit weight and flushing pressures in an attempt to optimise recovery. Stability of the six tonne drilling rig on the soft seafloor sediment and hole stability also influenced recovery. Despite these challenges we have recovered some very impressive core samples, representing the upper part of the extinct massive sulphide mounds, from the seafloor sediments, through the oxidised zone and into fresh massive sulphide. These cores represent by far the most significant rock samples collected from the subsurface of the TAG hydrothermal field. In addition to geochemical and mineralogical study these samples will be used for physical properties experiments to characterise the elastic wave and electrical properties of the sulphide deposits. This will aid the interpretation of the seafloor seismic data and controlled source electromagnetic geophysical imaging of the deposits and host rocks acquired by this project. 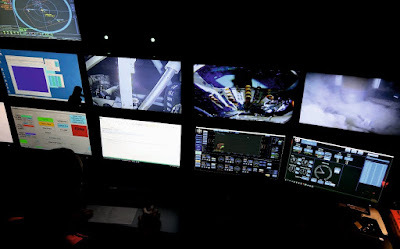 Inside the RD2 control container during seafloor drilling operations. 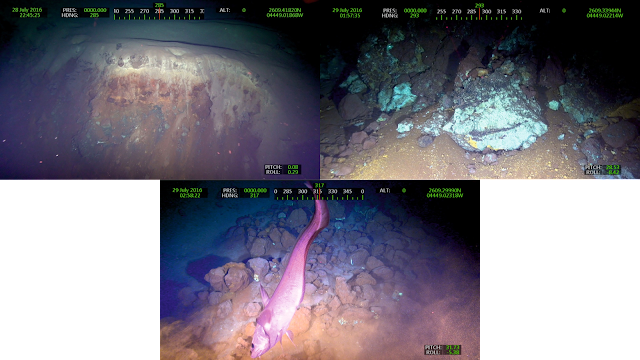 In addition to generally advancing scientific understanding of extinct seafloor massive sulphide deposits a key aim of the Blue Mining project was to demonstrate novel methodologies and tools (such as a self-potential exploration tool for autonomous underwater vehicles, automated seafloor image analysis systems, RD2) to explore for and assess these potential mineral resources, particularly under sediment or lava cover. The experience gained and lessons learnt about operating in this extreme environment during the two project cruises will be vital for advancing deep ocean mineral exploration and resource assessment technologies beyond their current technology readiness levels. 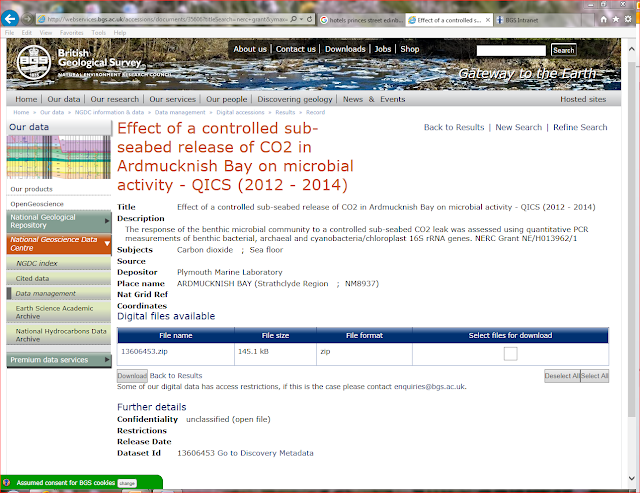 Over 900 Gb of digital and electronic data deposited with the British Geological Survey since July 2014 is now available at the click of a download button. Open data is at the heart of our work in Informatics and we are constantly developing ways of making that data available to the wider community. 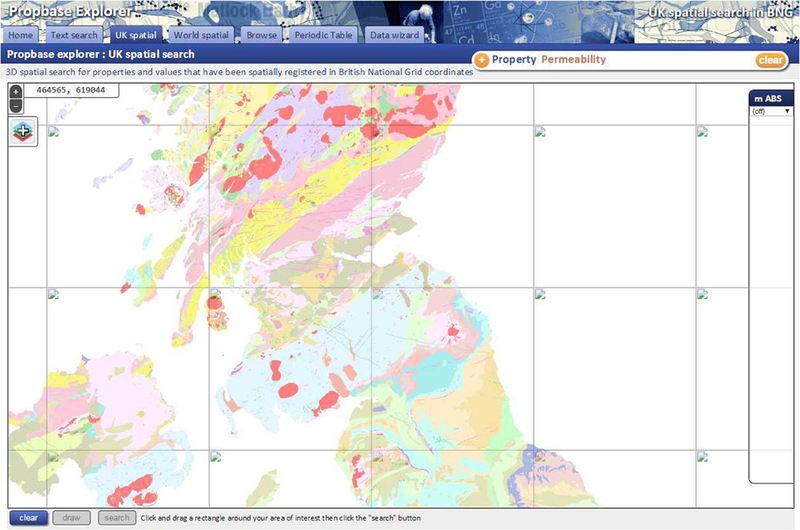 We have just launched a new search application which gives access to all open data deposited with the National Geological Repository (NGR) and National Geoscience Data Centre (NGDC) (including NERC-Funded Grants and UK Carbon Capture and Storage projects) and, in addition, holds all the Scottish data which has been relocated as a result of the move to the new Heriot Watt campus. You can search using keywords or a geographical interface. Items that are held digitally can be opened and viewed directly from the results screen. Physical items are available on request through our enquiry service. All data can be accessed by clicking here. Please note some data may be held with restricted access, in these cases a justification is supplied and a contact is given if you wish to gain further information. Hi, I’m Grace, a sixth form student at Rushcliffe School. 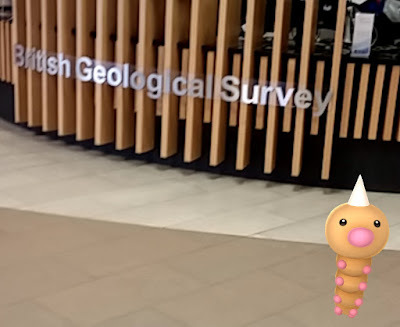 This past week I have been doing work experience at the British Geological Survey (BGS), a world leading geological survey who work to research environmental processes. I have a keen interest in geography so wanted to experience real life research into the relationship between past climates and the world as we know it today. This week I have been in the Stable Isotope Facility working in the geochemistry labs undertaking a wide range of techniques that are used in environmental change, pollution and hydrology. Overall I have found it fascinating seeing all the different scientific analysis that underpins climate change research, as well as how chemistry and geography work hand in hand with one another. For me the week has been mind-blowing and so technical - working with mass spectrometers and vacuums! Scientific equipment that I have never even seen before, this made the week even more intriguing for me as I have been doing things that I have never ever dreamt of! To begin with myself and Liam (another student on work experience) kick-started the week with vacuum extractions of soil samples, whilst using liquid nitrogen! Wow! I felt like a real life scientist, working with intriguing gases and chemicals. On Tuesday I was given the job of micro-carbonate preparation. This entailed weighing micrograms (very very small amounts) of sample material and carefully putting the sample into tiny vials that were to be later put into the mass spectrometer where their isotopes would be measured. On Wednesday I did carbonate preparation for isotope analysis in the morning, and in the afternoon we measured isotopes in water. The water samples came all the way from the Antarctic as ice cores from the ice cap!! It was interesting discussing with one of the geoscientists, Carol, about how ice cores from the Antarctic ice sheet are used in her research on climate change from 750,000 years ago to present. The water put into the mass spectrometer was measured for oxygen isotope ratios (18O/16O) and this data is converted into past temperatures. Carol has been able to show that Antarctic temperatures have changed over time and the western Antarctic is one of the fastest warming parts of the world. On Thursday Liam and I did some more carbonate extractions of carbon and oxygen isotopes where we had to prepare and extract the samples using a vacuum line and later used the mass spectrometer to find out the different carbon and oxygen values. Later that day we also went around all of the labs with Mel to help with a safety audit in order that she could keep a check on safety in the laboratories. Lastly but not least, on Friday we did a follow up on the data produced from our carbonate samples the day before. The samples we analysed were from a sediment core of a Loch, which had experienced periods with an inflow of marine water from the sea. Our data depicted a distinct difference in samples from those of freshwater and those from a marine environment from different periods of time. The change in the environment becoming more marine suggests that the change must be due to a sea level change (melting ice caps and glaciers that result in an increase in sea level) leading to marine water being able to reach the freshwater environment. Evidence of climate change, and the planet heating up! Overall, I have had a fantastic week that has opened my eyes to geochemistry and how the scientific analysis is so important into determining past climates. I would to like to say a huge thankyou to all of the staff for all the help, time and effort you have put into making my work experience so useful: Chris Kendrick, Jack Lacey, Carol Arrowsmith, Andi Smith and Melanie Leng. Grace Nicholls and her fellow student Liam Curtis are sixth form student at Rushcliffe School. Liam and Grace in the Stable Isotope Facility. I am particularly interested in geochemistry so was thrilled to find out I was going to be working in the Stable Isotope Facility, one of the best laboratories who work on isotopes in the UK! This facility measures the levels of different isotopes of various elements (e.g. carbon, oxygen, silicon) from samples of soils, minerals and rocks and uses this information to deduce what the climate and environment was like on Earth from millions to hundreds of years ago. The first thing we did after the mandatory health and safety and lab tour, was vacuum extraction of water from soil samples. This involved using liquid nitrogen (at –190oC!) and a very high vacuum to evaporate then capture all the water from the sample. After collection the water was to be analysed elsewhere (more on that later). This was really interesting physics and chemistry, it was very practical and visual as I could see the ice forming in the tube as it was sucked out of the soil. Next we started a three day long experiment analysing the different isotopes in some carbonate (its like limestone) samples from a loch in Scotland. This process was extremely useful and interesting as we both got to see and do an actual experiment from start to finish. For me this helped to both further my understanding of chemistry but also got me thinking about my future career as a scientist (maybe a geologist!). The first thing we did was prepare the samples, this involved adding very small amounts of the samples into phosphoric acid and removing all the air so any CO2 produced would not be contaminated by the CO2 in the air. As the carbonate reacted we collected the CO2 gas using liquid nitrogen (very useful stuff as CO2 condenses at these very low temperatures meaning we can move the CO2 around as a solid). We then analysed the CO2 using a very expensive instrument called a mass spectrometer. After we got the data, we analysed the results, coming to the conclusion that sea levels had risen over a period of 7,000 years starting 18,000 years ago as isotopes in the loch where closer to that of marine water to that of fresh water. It’s amazing that isotopes can tell us so much about the Earth. techniques - physics and chemistry! We also did some water isotope analysis (from the soil water extraction work we did). This started with pipetting 200 microlitres (a tiny drop) of water into vials to be analysed on the mass spectrometer. However it was not that simple, unfortunately mass spectrometers can only analyse gases. This meant that a workaround was needed. To do this the air in the tubes was replaced with CO2, and then the water and CO2 mixed, this caused the oxygen in the water to exchange with that in the gas, it was then this gas that was analysed. All very clever stuff! We also had a go at filtering sediments that where being cleaned in bleach (to remove organic material). These samples had tiny, tiny shells mixed within the sand, these shells needed to be cleaned (in the bleach) then extracted and analysed. So it was down to us to filter them. Fortunately we had plenty of fine sieves and it was exciting to see shells emerge from the dirt. The whole week has been interesting and useful, even the washing up. I now know what lab work is like and I have had a glimpse into geochemistry. This has made me more interested in the inorganic side to chemistry and allowed to see chemists in action. I am extremely grateful to all the people (Carol Arrowsmith, Chris Kendrick, Melanie Leng, Andi Smith and Jack Lacey) that gave up there time to help me and showing me around. It has been a fantastic week and really educational. Pokémon Go is the latest craze. Surely everyone must have heard about it by now? 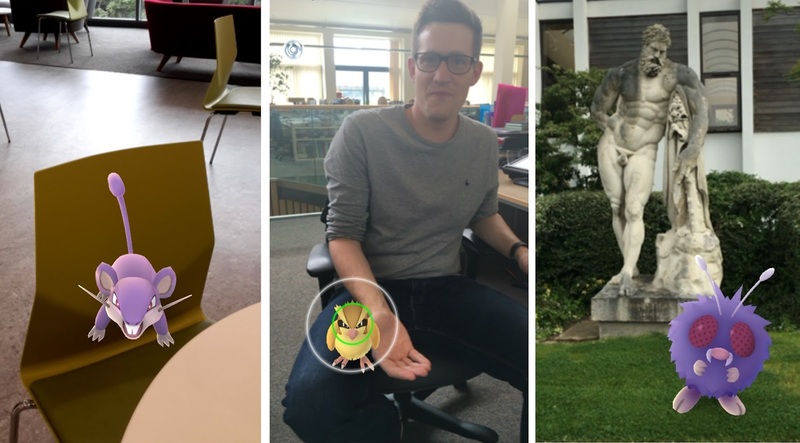 It’s in the news and on our streets as people go on the hunt for Pokémon as part of the new augmented reality game that’s taken hold of the nation’s imagination and smart phones. One lunchtime last week, my colleagues introduced me to this on their phones. 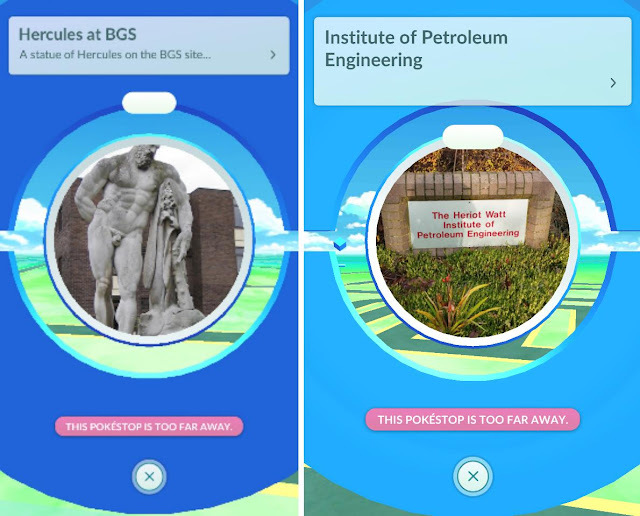 It was quite an experience and I found myself spinning a 166-year-old statue of Hercules for Pokéballs, chasing an angry-looking squirrelly-thing behind a building I didn’t even know you could get behind (which actually proved to be quite a lovely patch of garden), and talking Pokémon to a group of teenagers at a football club up the road from the office. Three things I certainly wasn’t expecting to happen that day and I doubt Hercules has had this much attention since the fig leaf incident in 1883. Don’t ask. Then we were suddenly in ‘a Lure’ and surrounded by confetti and we released pink incense and more Pokémon appeared. It was all tremendously bewildering and I laughed my socks off. Although I could have done without the ratty fellow. He was quite a bitey chap. If you don’t already know how it works, it’s a bit like a cross between Geocaching and Top Trumps. 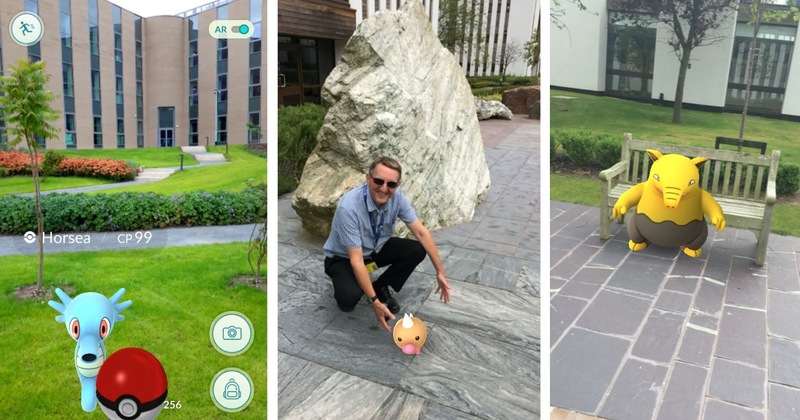 The general idea is that you hunt for Pokémon characters around you on your phone or tablet which uses your GPS and camera. Pokémon can appear in all sorts of places. You then throw balls at them to capture them. Pokémon mean points and points get you up the levels until you can go to the Pokémon Gym and go bananas. There’s probably a lot more to it than that but that’s all I know. L to R: Pokémon at our Herriot Watt office; our Clive with a worm sporting a party hat; a Fearow on a bench. 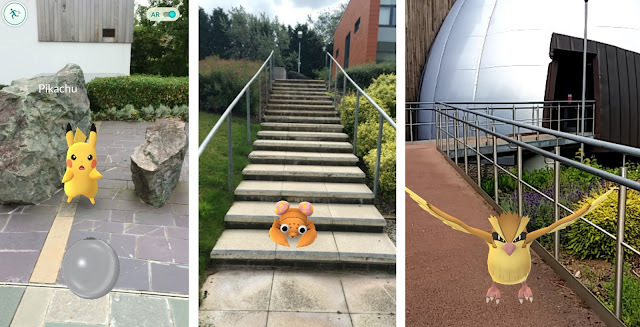 There’s been mixed press coverage on the game as people get so engrossed in the augmented reality that they forget the actual one their living in and do silly things like get stranded on an island or walk across a motorway. Luckily, most sensible people seem to be getting out and enjoying themselves. It’s also good exercise as there’s something to do with distance walked (you can’t cheat and drive it apparently) and the incubation of eggs that hatch into more Pokémon. the bitey ratty chap in the office; party hat worm on the Cromer Sheet?!! the James Hutton Building; An Alfred Hitchcock situation outside the William Smith Building. As part of the inaugural 2016 BGS Hack Challenge, we wanted to see if anything could be made of the BGS collection of digital photographs of core images; we have around 125,000 high resolution photos. There are also a number of different styles of plastic tray in use to hold the core for photography. So it was clear that we could not use a simple “cookie-cutter” approach for each photo. We would have to consider each image as being potentially 'out of registration' with the next one. Looking at the stages outlined above, it was clear that finding the corners of the boxes would be the greatest challenge. We looked into image analysis, and whilst we were able to run basic filters, we found it was taking quite some time to run, and, perhaps due to our lack of experience with the software, we were not going to be able to tweak it to produce reliable results in the time available. Therefore, to get us to the next stage in the task, we decided to use an image processing system that was many times more powerful than the graphics cards in our laptops, and that would take only a few microseconds to discern the core from the background. The name of the system? The human brain…. 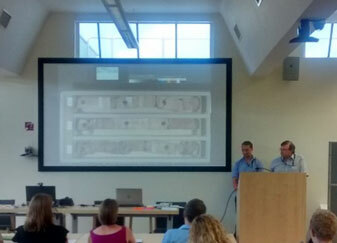 After barely a day of hacking in unseasonably hot conditions, we had a working demo. The user can enter a corebox number which loads the image and allows them to mark the corners of each box. 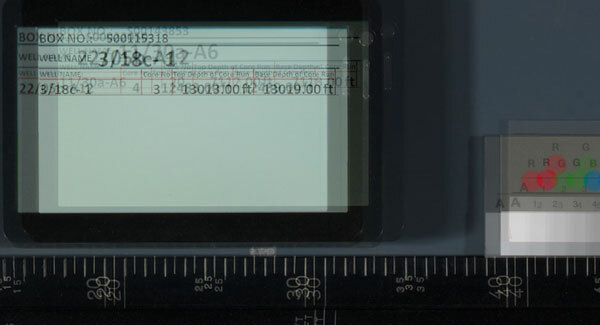 This information is then stored and sent to a script which cuts out the core, joins and rotates it, to give something like the image to the right. Running over WiFi, and on a laptop, the whole process took about 60-90 seconds. However of this only around 10 seconds is user input time, and the remaining processing could be stored until later. We also realised that we could “cascade” the cropping information to the next image, simply requiring the user to confirm the crop or perhaps adjust it as necessary. 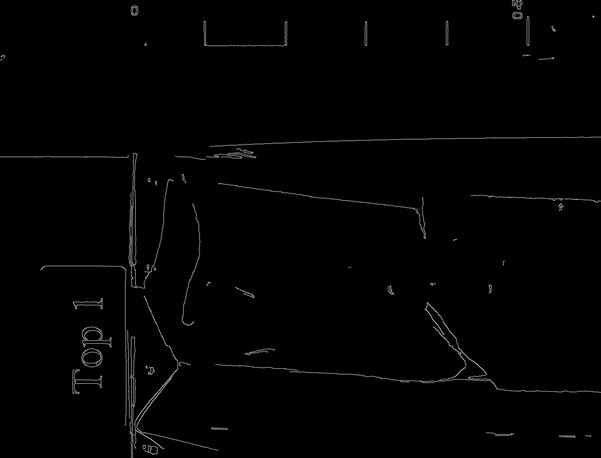 If in the future we are able to find the corners using entirely automated image analysis, we can simply drop the code into the workflow without too much hassle. For the purposes of the hack, however, I think it was a valid choice to use the method which allowed us to demonstrate the process in the time available. We also still have to work out how each sub-run is joined together to form the whole core, and write some more script which adds depth markers. There are some definite speed improvements that we can make, for example creating the JPEG preview from the JP2 in advance, or using the large image server to generate it on the fly. We’d still like to get the image analysis working, if not on the existing images then on any new images we take. There were enticing suggestions in the form of utilities such as “visgrep” and “zbar-img” that we could use to identify the type of tray in use and also the position in the image, and from there apply a standard crop. I thoroughly enjoyed the hack – often I feel that I know that something can be done, but am clueless to how to actually achieve it. Working directly with people whose skills complemented mine was an ideal and effective way to solve this problem. I feel that, given the time available, we were able to show that a process we previously believed to be impossibly time consuming to achieve could in fact be broken down into smaller chunks and made achievable. The next step is to consult some of the many users of the core images, and see what their thoughts on the matter are. Simon Harris (BGS Conservator / Hack participant) and the hack team of Paul Denton, Brian Hamilton, Andy Riddick, Roman Roth and Paul Williams. The Rio 2016 Summer Olympics are nearly upon us when more than 10,500 athletes from 206 countries will take part in 306 events in 28 Olympic sports. 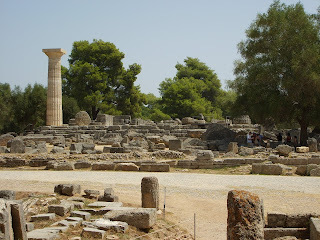 The event has come a long way since the first Olympic Games held in the sanctuary of Zeus at Olympia, Greece in 776BC. It is this legacy that got me thinking about all the other places around the world that share their name with this behemoth of sporting achievement. For most of us, we have more chance of visiting one of these places than actually taking part in the Olympic Games! The word Olympic literally means 'of Olympus or 'of Olympia' with Olympus being famous in mythology as the home of the Greek gods, so it's no wonder that there are a number of locations across the world (and beyond) that have chosen to share that name. We've decided to have a look at these places and see if their geological heritage meets the 'gold medal' standard. The home of the original Olympic games, Olympia is located in the north west of the Peloponnese, and was established in the valley created by the confluence of the Alpheois and Kladeos rivers. Despite its size, Olympia was not a town, but a sanctuary with buildings associated with the worship of gods and with the games themselves. Although established in 776BC the games continued until the last Olympiad in 393AD, and even survived a series of earthquakes in the 3rd century that inflicted heavy damage on the site. It was the Christian Roman Emperor, Theodosius I that banned the Olympiad and all games ceased during his rule. Olympia was still used as a sanctuary after that but was abandoned in the 6th century when it was rapidly buried under approximately 4 to 6 metres of sediments. It was rediscovered in the 18th century and up until relatively recently it was thought that the site was destroyed by high-energy catastrophic floods. However, new evidence, including the presence of marine shells indicates that this was more likely a tsunami impact, and that the cult site was destroyed by tsunami rather than fluvial processes. Mount Olympus is the highest mountain in Greece and is located in the Olympus Range on the border between Thessaly and Macedonia. It has 52 peaks and a number of deep gorges that in Greek mythology are thought to be the home of the Twelve Olympia gods of the ancient Greek world. The Olympus range is made up metamorphosed and deformed limestones from the Triassic and Cretaceous to Palaeogene. During the Eocene period, these were tectonically overridden by a series of much older basement gneisses, granites and metamorphic rocks. During the Neogene, uplift caused the Olympus limestones to be exposed in a type of 'window', with the overriding older rocks now seen as a concentric arrangement on the flanks of the Olympus Range. However, it is the deep valleys, formed during the Pleistocene to Holocene that are perhaps of most interest. Their morphology indicates a complex and repeated history of glaciation, tectonic uplift and rapid fluvial erosion and are definitely befitting of their status as the home of the gods of ancient Greece. 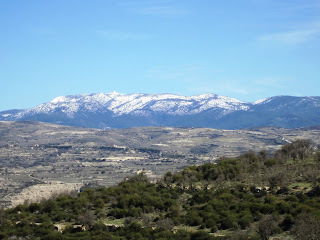 Mount Olympus in Cyprus is at the very heart of the Troodos mountain range. The range is dome-shaped with Mount Olympus being its highest point at 1952m. Troodos is what is known as an ophiolite, a name used to describe a distinct group of rocks that make up the oceanic crust and the underlying upper mantle, that have been uplifted and are now exposed. 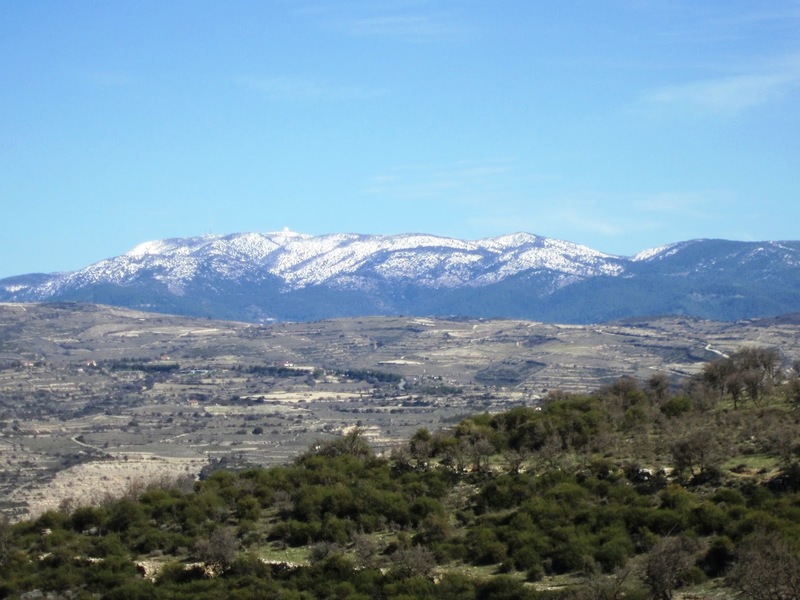 The Troodos ophiolite is world-famous and one of the most studied due to its complete lithological sequence, its structural integrity, its excellent exposure and its ease of access. The complete sequence of an ophiolite is complex, but very generally there are five distinct layers; the oldest is peridotite, followed by gabbro, and then sheeted dykes, before pillow lavas, and finally sediments that accumulated on the sea floor all of which can be seen at Troodos. Olympic National Park is located on the Olympic Peninsula in the state of Washington on the rugged Pacific coastline of the USA. 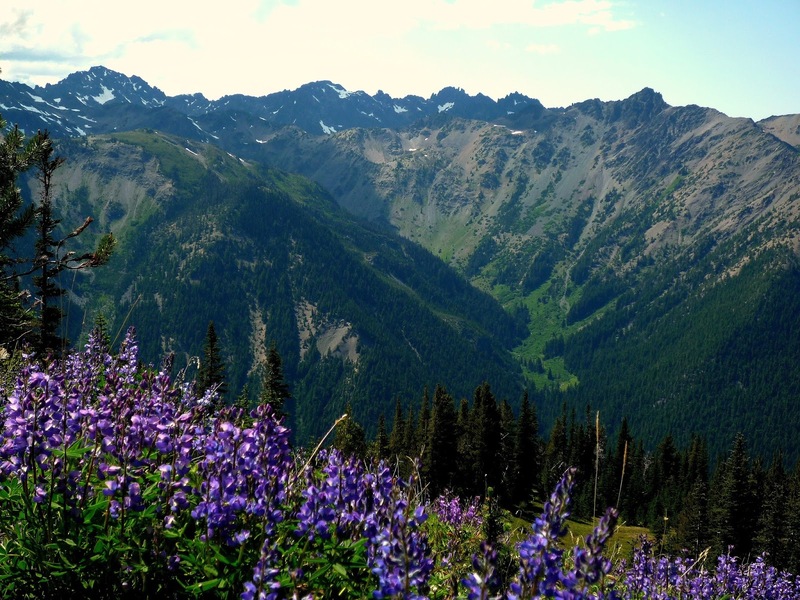 The focal point for the National Park is the Olympic Mountains part of a series of mountain ranges along the west coast of North America called the Coast Ranges. Made up of Neogene oceanic sedimentary rocks and submarine basalt formations, the Coast Range is a belt of uplifted land that formed as a result of plate convergence. Approximately 400km to the west, in the Pacific Ocean lies the spreading centre, similar to the Mid Atlantic Ridge, that separates the Pacific plate and the Juan de Fuca plate that is being pushed beneath the North American plate (known as the Cascadia Subduction Zone). 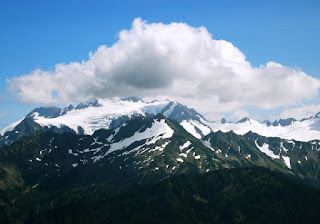 The mountains themselves are made up of the sediments that are being scraped off the top of the Juan de Fuca plate as it is being pushed beneath the North American plate, known as an accretionary wedge. 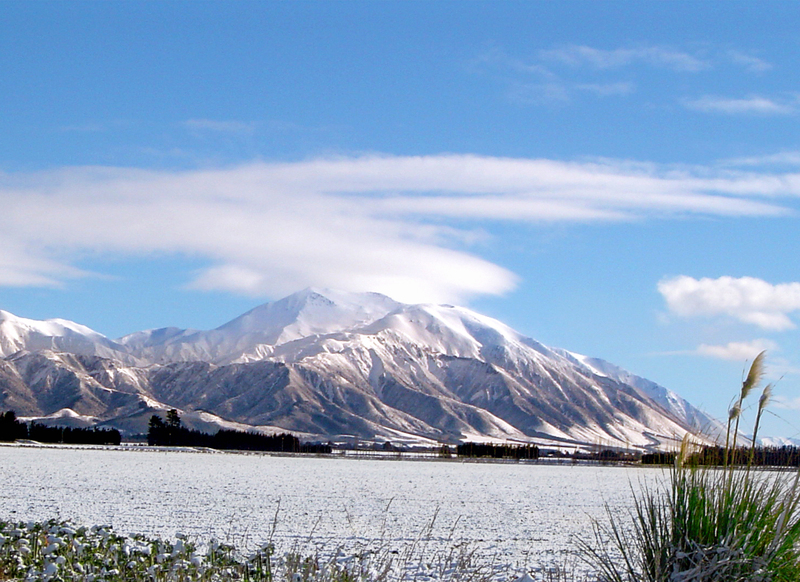 Located on New Zealand's South Island, Mount Olympus is perhaps best known as a ski area. 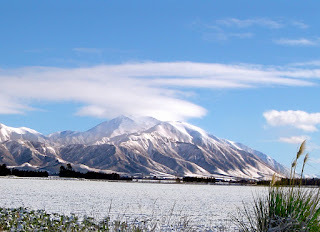 It is part of the Craigieburn Mountain Range which in turn is part of the Southern Alps. New Zealand lies at the edge of both the Australian and Pacific plates. At North Island the Pacific plate is moving towards and being pushed under the Australian plate, and at South Island whilst they are still moving towards each other, the Australian plate is being pushed under the Pacific plate. This active tectonic setting means that much of New Zealand lies within a seismic zone and therefore subject to earthquakes. The Craigieburn Mountain Range has been studied due to its history of rock avalanches, triggered by large earthquakes at least 7 of which have occurred in the area in the last 6000 years. So we've cheated a bit with this one and have included a site that isn't even on Earth, but at a height of 25km, nearly three times as tall as Mount Everest, we couldn't leave this one out. 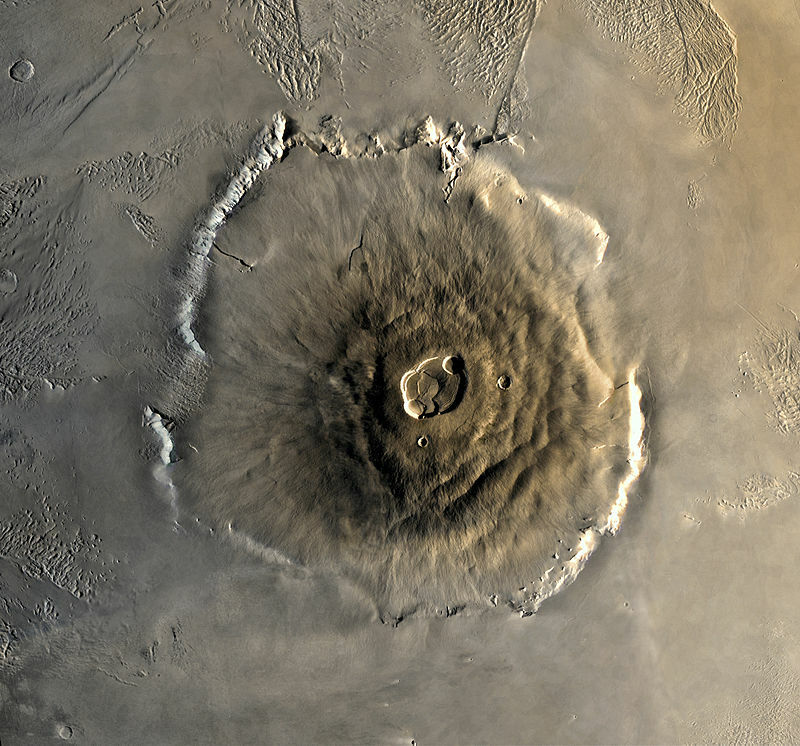 Olympus Mons is the largest volcano in the solar system and is a really good example of a shield volcano. This type of volcano forms from very fluid magma and is so named due to its large size and low profile, thought to be like a warrior's shield. The size of Olympus Mons has been debated and it is proposed that it is so large because the lack of plate tectonics on Mars meant that rising magma erupted on the same part of the planet over a very long period of time. 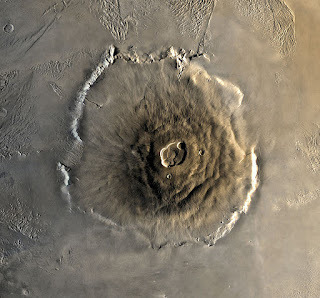 Olympus Mons is just one of a number of volcanoes on Mars and it is thought that volcanic activity ceased due to eventual cooling of Mars' core. in the TAG hydrothermal field. We are now a few weeks into the RRS James Cook (JC138) cruise to the Trans-Atlantic Geotraverse (TAG) hydrothermal field of the Mid-Atlantic Ridge at 26oN, 45oW, with about 14 of the original 31 science days remaining. Hydrothermal activity and mineralisation were discovered here in the 1970s, at water depths in the range of 3400 to 3500 metres. The current cruise forms part of the ‘Blue Mining’ EC-funded project, which aims to bring sustainable deep sea mining a major step closer. 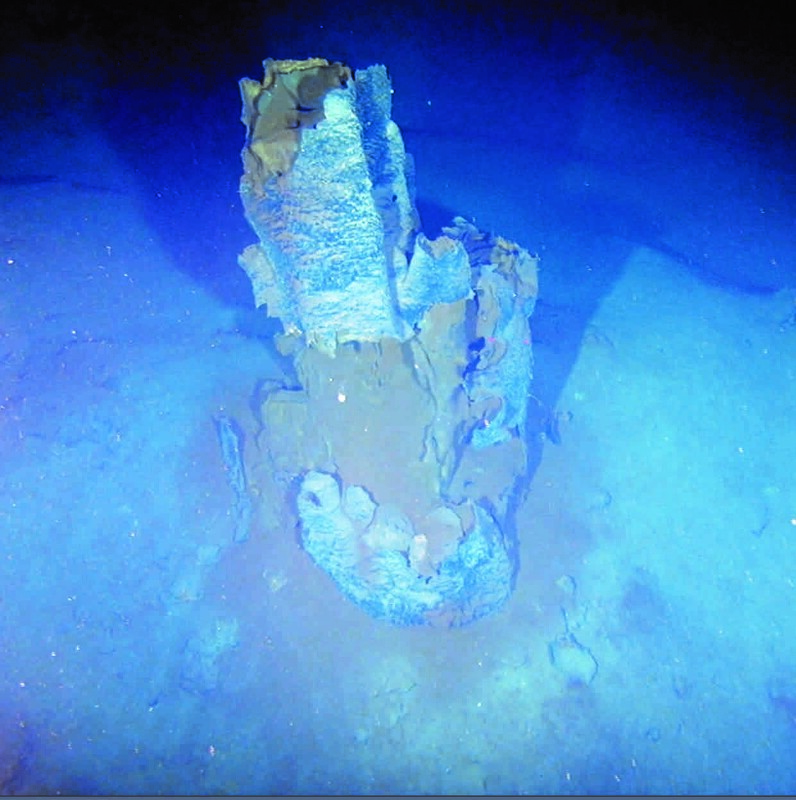 In a duration of 48 months the Blue Mining project will address all aspects of the deep sea mining value chain, from resource discovery to resource assessment, and from exploitation technologies to the legal and regulatory framework. This cruise focuses on the exploration and resource assessment phases of the project, with the aim of characterising the seafloor environment across the TAG field, with a particular emphasis on mapping and sampling the extinct Seafloor Massive Sulphide (SMS) deposits. In an attempt to develop new tools for exploration and subsurface imaging of extinct SMS deposits (which unlike active deposits cannot be easily traced through physical and chemical anomalies in the water column), we are testing a range of Controlled Source Electro-Magnetic (CSEM), magnetic and seismic geophysical techniques. We have deployed the University of Southampton’s Deep-towed Active Source Instrument (DASI), and the three-axis electric field receiver, Vulcan, which will provide an image of the seafloor resistivity structure. ‘Sputnik’ is a novel and futuristic looking CSEM transmitter system, with shiny balls for high voltage seafloor electrical transmission has been used over a 24 hour period. This device is lowered to the seafloor where the arms are unfolded and it transmits electromagnetic waves. It is then lifted about 50 metres above the seafloor and the ship is moved to the next sample station where it is lowered for another transmission. Selected images from the HyBIS dive on Southern Mound. Clockwise from top left: 1) Fault scarp showing carbonate ooze overlying oxidised sulphide-rich debris flow material with massive sulphide below, 2) Atacamite covered boulders on the seafloor, 3) A fish on Southern Mound captured during the HyBIS surveying. 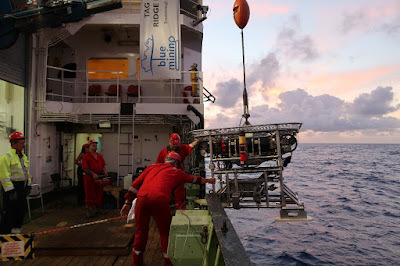 The geophysical experiments have been interspersed with dives using the National Oceanography Centre’s robotic underwater vehicle (HyBIS), deployment of the British Geological Survey’s latest generation of remotely operated sub-sea rockdrill (RD2), and seafloor sediment coring. HyBIS has made five dives, undertaking sampling using its manipulator arm and making video traverses across the sulphide mounds. The dives have provided highly informative images of the expression of the seafloor mineralisation, its relationship to faulting, the basaltic host rocks, and the extent and thickness of hydrothermal precipitates and sediment cover. 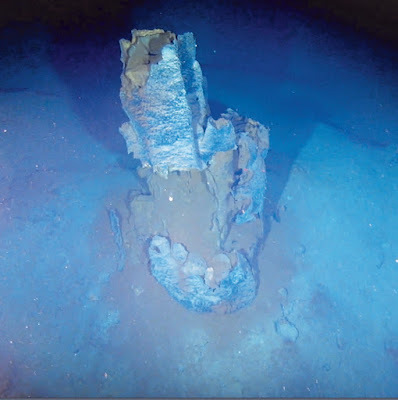 A highlight was a HyBIS dive which went across a major seafloor feature, probably a ‘lava lake’ (discovered on the high resolution bathymetry obtained on the sister Blue Mining cruise M127), culminating at the spectacular active black smoker complex of the TAG mound. Notably, this dive located two funnels (to allow the drill string to re-enter the holes during the drilling process) installed during the 1994 Ocean Drilling Programme: Leg 158. We have also captured impressive images of the deep-ocean seafloor fauna (e.g. fish, anenomies, crabs, sea slugs etc.) and bacterial mats. We have also seen the enigmatic honeycomb-like Paleodictyon structures on the seafloor, which are postulated to represent burrows arising from a creature possibly cultivating bacteria. HyBIS has proved invaluable for surveying potential drill sites for the RD2 rig. During the dives we have been placing flashing LED beacons on the suitable locations identified to aid subsequent positioning of the rig on the seafloor. Even with the new GEOMAR high resolution (50 cm grid) autonomous underwater vehicle (AUV) acquired bathymetry data and HyBIS surveying it has been very challenging to locate sites which are of a suitable size and have a low enough slope angle to accommodate RD2. massive sulphide deposit at Southern Mound. We have regularly deployed the RD2 drilling rig on Southern Mound, with mixed success, due to a combination of technical issues and the challenges of landing the rig on the uneven seafloor, which typically has a thick (>2 metre) cover of very soft sediment. The drill deployment involves positioning the ship above the recorded beacon location, lowering the 6 tonne rig to 30–50 metres above the seafloor (typically 3450 metres water depth, so it takes about 2 hours for the rig to reach this depth) at which point the flashing beacon generally becomes visible on the RD2 cameras. It is then sometimes necessary to make small changes to the rigs position to ensure that it is directly over the target location before landing it on the seafloor. Moving RD2 is only possible by making small changes (typically 5 metres) to the ships position, but small and accurate movements are very difficult due to the rig hanging about 3.5 km below the ship. This positioning accuracy is vital due to the small dimensions of the suitable landing sites we have identified with HyBIS (typically with a maximum size of 15 x 15 metres, compared to the 3 metre square footprint of RD2). Once the rig contacts the seafloor it is an anxious wait viewing the fluctuations on the pitch and roll sensor display to determine if the landing site is suitable for drilling. Due to the thick, soft sediment cover it has not been possible to make significant adjustments to the angle of the rig on the seafloor as the sediment offers no resistance and the legs simply dig in. Despite these challenges we have started drilling two holes, recovering some sample material from the upper part of Southern Mound, before technical problems have required recovery of the rig to the surface. We will persist with the drilling over the remainder of the cruise as the aim is to drill long holes into the cores of the sulphide mounds to understand their deep subsurface mineralogy and form. 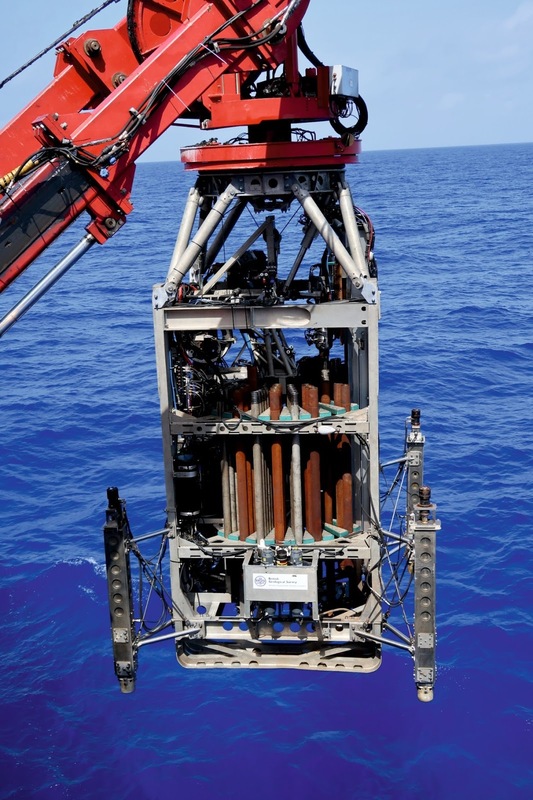 Sediment cores obtained using gravity and mega coring are providing new insights into the nature of the seafloor sediments (up to 2 metres below the seafloor) across the TAG field. The sediment cores record a dynamic seafloor environment, typically consisting of dark red, oxidised layers probably representing mass wasting of sulphide-rich material from the mounds, intercalated with carbonate ooze, and darker layers likely to originate from hydrothermal plume fallout.